Twenty-one thousand, three-hundred ninety-five. That’s the difference between Kyle Lampe, the English literature scholar and Kyle Lampe, the chemical engineer. That number is the difference in enrollment between Iowa State University (26,110) and Missouri S&T (4,715) when Lampe started college in 1999. Bigger was not better for Lampe, who earned a bachelor of science degree in chemical engineering at Missouri S&T in 2004, and now is an assistant professor of chemical engineering at the University of Virginia. “I didn’t want to go to Iowa State because it was just too big,” says Lampe, who grew up in Clarinda, Iowa – a town of 5,806. “I felt like I would get lost there. These days, Lampe leads his own “nerdy” engineering students in cutting-edge research that may one day lead to cures or treatments for diseases such as multiple sclerosis, Alzheimer’s disease, Parkinson’s disease and people who have suffered a stroke or a spinal cord injury. 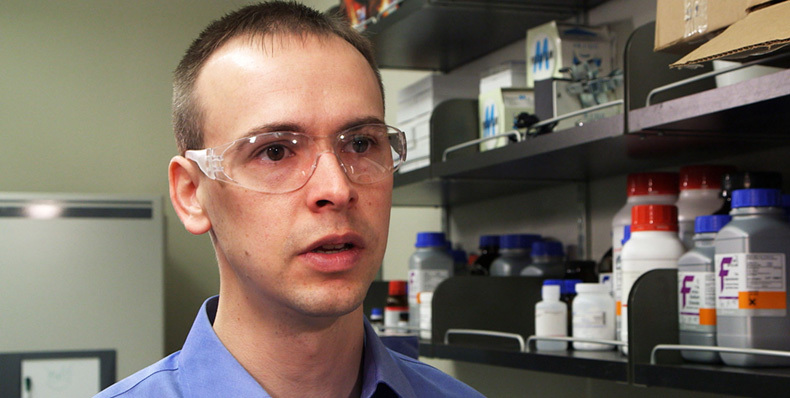 The work is done through the Lampe Biomaterials Group, which launched at U.Va. in 2014. There, Lampe is using synthetic polymer materials to encapsulate oligodendrocytes in a 3-D hydrogel that simulates properties of the brain. Oligodendrocytes are cells with many branches that support and insulate axons in the central nervous system by wrapping the axons in a myelin sheath. In people with MS, Lampe says, the oligodendrocytes go haywire. Finding a way to target or replace the malfunctioning oligodendrocytes could lead to a treatment. For people who have suffered a stroke — the second-leading cause of death worldwide — treatments such as transplanting neural stem cells are ineffective, Lampe says, because 95 percent of those cells die within a week. Using a new biodegradable polymer hydrogel might be more effective because as they erode, they scavenge free radicals, thus acting like an antioxidant in the brain. Being able to place the slowly released antioxidants in a specific site of injury could help limit a stroke’s damage, Lampe says. It’s the kind of work Lampe was — well, maybe not born to do, but it’s his life’s work now. “I knew I was interested in engineering and science, the STEM disciplines,” says Lampe, who saw one of his older brothers, Paul, graduate from S&T in 1990 with an electrical engineering degree. Kyle credits his advisor, Oliver Sitton, associate professor of chemical and biochemical engineering, with igniting his spark for research. With Dave Westenberg, associate professor of biological sciences, he dove into research. From Rolla, Lampe went to the University of Colorado Boulder for his Ph.D. in chemical engineering. After five years at Colorado, Lampe worked as a post-doctoral fellow at Stanford University for three years to prepare for a research-intensive faculty position. He has no problem with motivation. At S&T, he kept busy, not just with coursework. He was a resident assistant for two years at Thomas Jefferson Residence Hall, and then was the head RA at the Quad. He also acted in nine plays and musicals, including My Three Angels, The Foreigner, My Fair Lady, Guys and Dolls, and Camelot. And he met his wife of eight years, Lisa Hartman Lampe, who earned her bachelor of science degree in applied mathematics from S&T in 2004. Lampe also works at Virginia as the director of undergraduate success in the School of Engineering and Applied Science. For Kyle, everything that has followed started at S&T. 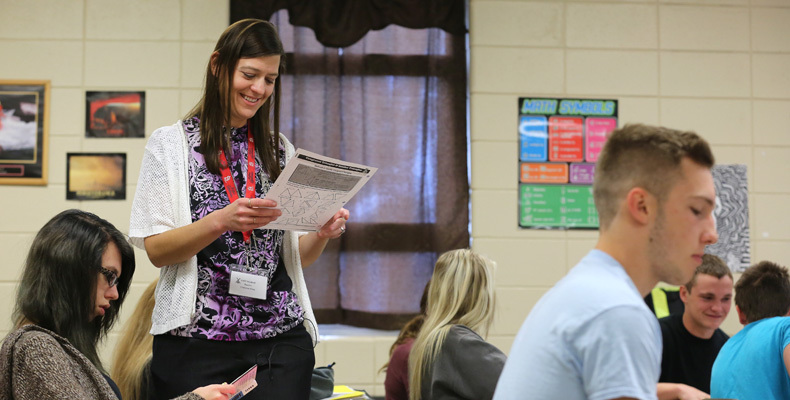 “Obviously, I got my initial training in how to approach research not from a lecture course, but with an approach toward getting the students to ask the questions,” Lampe said. “Moreover, I found this trait in many of the leaders at (S&T); students were really imbued with the authority to do things. We got the direction and support we needed and often failed. But that was part of it. As an RA, we had a lot of training, but the learning was a process, never complete. Graduate. Tour Europe. Work for Google. Oh, sure, first there is studying for and passing final exams to get through: World Literature and Biotech and Film and a presentation and paper in Object Oriented Numerical Modeling. 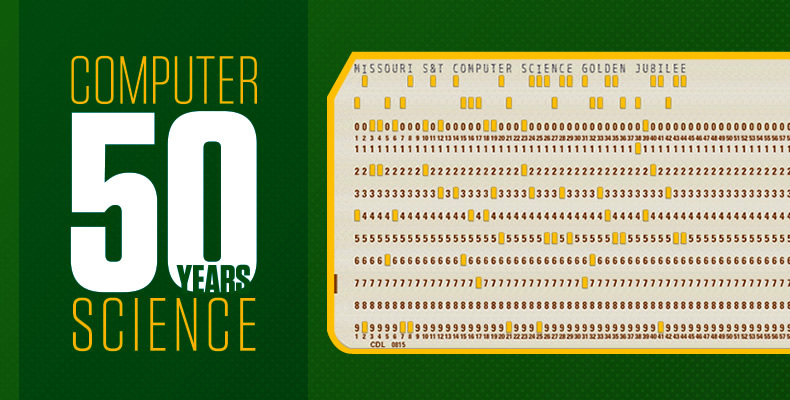 But for Gantner, a senior computer science student at Missouri S&T, the future is going according to plan. It’s a plan more than three years in the making; a plan that S&T advises students to follow; a plan the university actively encourages them to pursue. Gantner secured a co-op with Nucor Yamato Steel from January to August 2012. He worked full-time and part-time internships for Garmin from January to July 2013. And he nabbed an internship with Amazon.com from May to August 2014. He hit the ground running in all three. But he believes that the last internship, the one with Amazon, really put him on Google’s radar, where just getting an interview is half the battle. After an initial interview in October, Gantner was invited on-site in Boulder, Colorado, in early November. He studied for 10 hours before his first interview — and for 15 hours before the on-site trial. In the on-site interview, he had to write code while Google team members watched, asking him questions about why he went about things the way he did. They wanted to know the thought process that went into it, looking for more than just a programmer, but instead for someone who could think logically about problems he would face in the job and articulate ways to solve them. His day was broken up in to four 45-minute interviews. His lunch break wasn’t a break but pretty much an interview, too. After spending the day in Boulder, the wait began. He was cautiously confident. 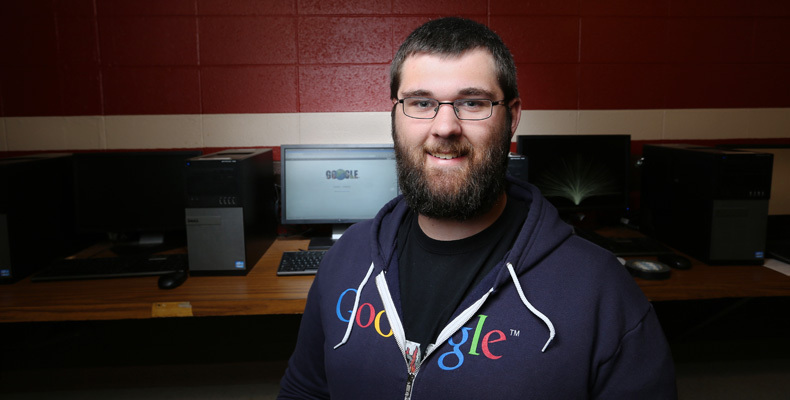 In late November, Google offered him a job as a software engineer. Of course he said yes. “It’s the best place to work in the country — if not the world,” Gantner says. And maybe it wasn’t just three years ago that he started on the road that has led him to Google. He came to Missouri S&T’s CHIP camp (Computer Highly Interactive Program), now known as CyberMiner Camp, before his senior year of high school. By then, he knew where his future was headed — to Missouri S&T. When he was a teenager, Missouri S&T doctoral student and NASA employee Paul Friz looked up into the night sky, the twinkling points of light a thousand beacons in the darkness, irresistible. He was hooked. So when he was 14, Friz saved up his lawn-mowing money and bought his first telescope – an 8-inch Dobsonian Reflector – to bring the sky’s lights up close. He looked at the gas giant Saturn; it’s the solar system’s sixth planet from the sun and looks like a star to the naked eye, but its rings and moons came to life in his telescope’s lens. Then he went farther into the heavens and out of Earth’s solar system – somewhere between 520 to 610 light years out – to view M44, or the Beehive Cluster, located in the constellation Cancer. “I believe I chose those objects because they were easy to find in the sky, and I didn’t really know what I was doing at that point,” Friz says. Looking through that first telescope in a cemetery behind his Creve Coeur, Missouri, home was the first step in a journey that has led Friz, 25, to where he is today: working as a NASA Pathways intern in Langley, Virginia, and pursuing his Ph.D. in aerospace engineering from S&T. At NASA, he’s learning software tools that will help him complete cost analyses for space missions, taking into account a mission’s lifetime, research and development, maintenance, operating costs, scientists’ hours – basically everything that has a dollar amount. 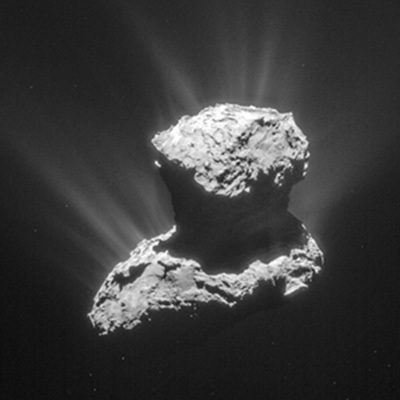 Before that, Friz was at NASA’s Jet Propulsion Laboratory in Pasadena, California, as an assistant to the project manager on the Rosetta mission that put an orbiter around comet 67P/Churyumov-Gerasimenko. His specific job involved writing software to analyze the data coming from the Microwave Instrument for Rosetta Orbiter, or MIRO, that’s on the Rosetta spacecraft. MRIO measures the comet’s gas emissions, which, Friz says, are mostly water with smaller amounts of ammonia, carbon dioxide and methanol. He was there when the orbiter launched the Philae lander that synched up with and landed on the comet. When it finally touched down and started sending data, the relief in the room was palpable. The path that led him to being there in the room with the other NASA scientists just sort of came about naturally. After earning his bachelor of science degree in physics from Truman State University in Kirksville, Missouri, he came to S&T and earned a master of science degree in aerospace engineering. He worked on two different projects during his master’s studies, and both are part of his thesis. Because his interests are wide and varied – he was an orchestral violinist at Truman State and is an accomplished photographer – he hasn’t settled on a Ph.D. area of concentration. 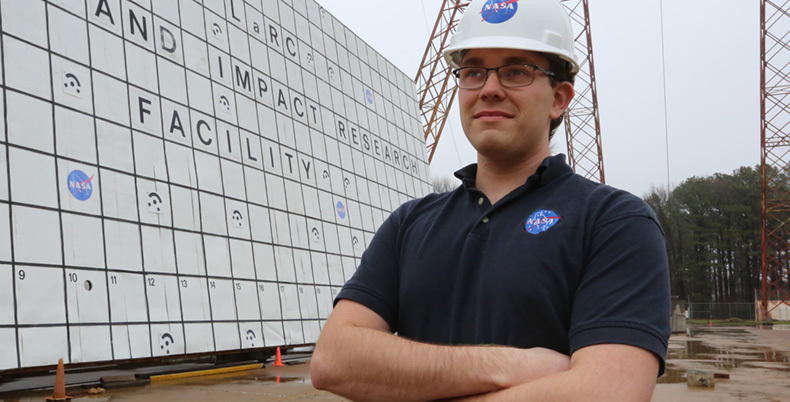 He’s plenty busy as it is with the work he’s doing for NASA – his dream long-term employer. Projects such as sending astronauts to Mars and an asteroid redirect project that aims to capture an asteroid and put it in orbit around the moon hold his imagination. “They’re bigger than anything NASA has done; bigger than the Apollo landing,” Friz says. He acknowledges, however, that these big-dream projects have no guarantee of being funded. “It seems that Mars has been 20 years away ever since we landed on the moon,” he says. Still, he’s undeterred. The stars of his youth are the stars of his future. Hard hats? Check. Overalls? Check. Steel-toed boots? Check. In an unusual twist on the fairy tale wedding, Missouri S&T alumni Genevieve (DuBois) Bodnar and Greg Sutton were married underground at S&T’s Experimental Mine on Dec. 20, 2014. Wearing hard hats, overalls and steel-toed boots, the couple tied the knot before hard-hat-wearing friends and family. Bodnar and Sutton first met at a Society for Mining, Metallurgy and Exploration meeting in St. Louis about eight years ago. They’ve both participated in and judged the International Intercollegiate Mining Competition, which is considered by some to be the Olympics of mining, with seven events that demonstrate techniques used by old time miners. “We just came up with the crazy idea we wanted to be married in the student mine,” says Bodnar, who earned bachelor’s degrees in metallurgical engineering and mining engineering from S&T in 1998 and 2001, respectively. Bodnar also helped start the Haunted Mine that’s become a Rolla Halloween staple. 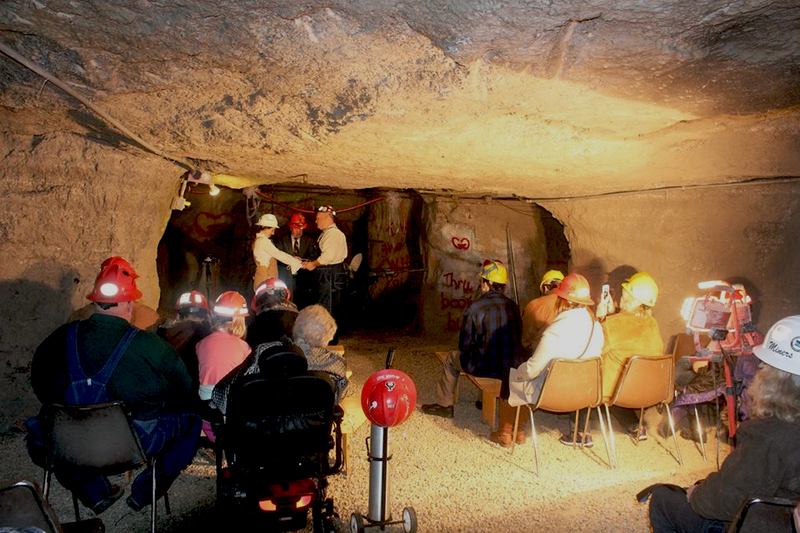 The wedding took place about 100 feet inside the mine from the adit – the horizontal entrance to the experimental mine. Portable lights illuminated the ceremony. “We decided to do it that way because of our great appreciation of mining,” says Sutton, a 1988 mining engineering graduate. Sutton helped teach a drilling and blasting lab and a surveying lab at the mine during his time on campus. He also worked at the experimental mine as a laborer. Jimmie Taylor, the experimental mine supervisor who oversees all mining operations, including explosives storage inventory, has worked at S&T since 1992. He’s seen about all there is to see when it comes to the mine – until December. “It’s the first I have heard of anyone getting married at the mine,” he says. They capped the ceremony – literally – by setting off seven blasting caps with an old-time plunger detonator on a five-second delay. Dr. Paul Worsey, director of explosives engineering education and professor of mining engineering, and senior mine mechanic DeWayne Phelps set up the explosions, Taylor says. Dr. Samuel Frimpong, chair of the mining and nuclear engineering department, gave permission for the wedding to take place – safely. No alcohol was served. These days, Sutton runs G&G (Genevieve and Greg) Mining Solutions in Bunker, Missouri, where the two make their home. Genevieve works for the Doe Run lead mining company, which is where Greg worked from 1992 to 2014. For the couple, mining is in the blood, and getting married in S&T’s experimental mine was the next logical step. “It was a way to incorporate our passion for each other into our passion for the mining industry,” Sutton says. Are you one half of a Miner couple in love? Share your story in the Comments section.